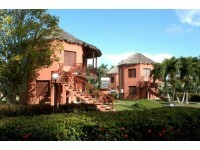 Santa Clara is a cultural destination ideal for all travelers who are enjoying the tropical beaches of Cayo Santa Maria. Located 100 kilometers (62 mi) from the cays of the archipelago of Jardines del Rey, Santa Clara stands out as a colonial city in the heart of Cuba, with museums and art spaces. This locality is famous for being the resting place of one of the commanders of the Cuban Revolution, Ernesto "Che" Guevara. Visitors can see the mausoleum and memorial, set on Revolution Square. Folklore lovers can admire the exhibitions at Museo de Artes Decorativas and visit Juan Marinello Vidaurreta House of Culture. La Caridad Theater, built in the 19th century, and the neo-gothic Saint Claire of Asis Cathedral, are cultural landmarks in the heart of the island. ***The legal currency for transactions in Cuba is the Cuban Convertible Peso (CUC).